One of the biggest day-to-day battles I face is convincing students to turn assignments in. If I give students an assignment and tell them it is due at the end of class, some of them will find a way to lose it before the bell rings. They won’t leave the room, and yet the assignment will vanish into thin air. It’s like I’m teaching in the Bermuda Triangle. Last year, this daily headache induced a destructive attitude in me called the “take-what-you-can-get” method. I would be grateful to receive a worksheet from some students within the month I had assigned it to them. My late work policy became lax, my mercy was at an all-time high, and students who were setting a low bar for themselves continued to jump that low bar with my help. The problem with the low-bar method is that people often meet the expectations you set for them. If you expect greatness out of someone, and push them to get there with the tools and motivation to be successful, they have a high probability of becoming great. Conversely, if you expect little to nothing out of someone, they will probably not attempt to convince you otherwise. That statement should make you angry. I hope you don’t believe that just because children are dealing with incredibly difficult circumstances means they don’t care about school or can’t perform at a certain level. That story—long told and widely accepted—is a tall tale. I am going to get vulnerable here: I don’t believe this tall tale, but I have allowed it to be told around me. I set a high bar for my students, but when they didn’t live up to it, I often caught myself lowering the bar rather than pushing my students harder. I caught myself accepting less from them because I feared I was expecting too much of them. I caught myself—I am ashamed to admit—pitying my students because the odds were against them. I have never heard a good story where pity helped the protagonist succeed. I have never known a person who got somewhere great because others let them “get by.” I have never seen great heights reached by people who only cleared low bars. True, my students are dealing with a lot more than I can understand. Some of them are in single-parent homes. Some of them are all too familiar with the weight of poverty. Some of them have lost more people in twelve years than I have lost in twenty-three. Each and every child everywhere struggles with something, not just because of circumstances, but because they are all human. To be alive is to struggle. Though my students struggle, they do not need me to lower expectations, accept failure, or pity them—even if it is well-intentioned. My students need me to set a high bar for them and then help them clear it. My students need me to teach them that colleges, workplaces, and the world at large have no interest in the tall tale about the struggling kid who needs lower expectations. They care more about the underdog story. They care about the struggling kid who overcame immense obstacles to graduate college, run a company, save lives, and help other kids who are in need. They are searching for the next Steve Jobs, the next Jay Z, the next Lupita Nyong’o. We do a disservice to our children, our future, and our world when we tell the tall tale that kids in tough places cannot do hard things. The reality is that they do hard things every day, whether or not those hard things are always apparent in school. The woman who made the comment about her students expects them to fail, and increases their risk of failing by perpetuating the stereotypes that exist about them. I’m not saying she is a bad person, or that she hates kids. But she has bought into the tall tale. Until she believes a different story can be told, she will continue to tell the same story about her kids and she will be one more person they have to resist to succeed. It is hard, both for my students and me, to resist these popular stories and reach for better narratives. But lower bars do not challenge us to reach for anything new. Lower bars harm us, and keep us at status quo. No one gets to the moon by staring at the ground and hoping for the best. This year, I give my students homework every week, and only allow students who complete all of their homework to go on our field trips. We had 66 students on the first field trip. I assign an outside reading project every six weeks, and students cannot pass the six weeks without completing it. Though I had around 15 students fail the first six weeks, only 6 failed the second six weeks. I’m aiming for 0 this time around. My students and I have grown tremendously since I raised the bar. They are not discouraged when they don’t reach it, but encouraged by my belief that they will soon enough. Someday they will run their own companies, save others’ lives, and change the world as we know it. Those who listen to the tall tale now will be surprised, but I won’t be. 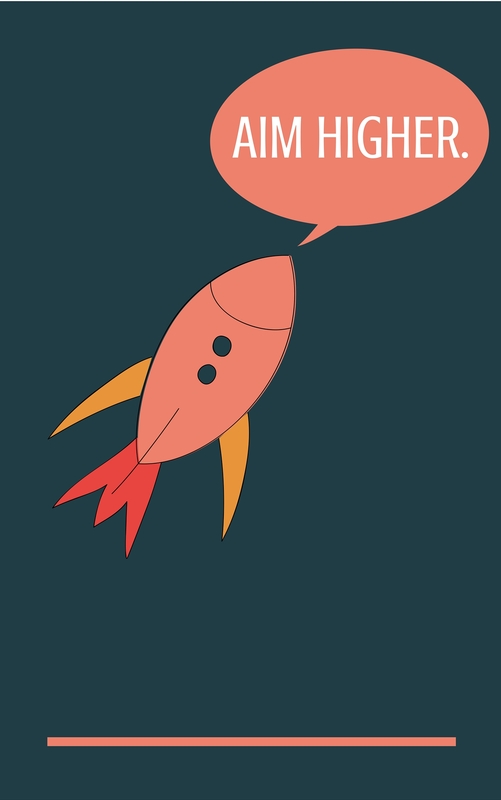 If you have set the bar low for yourself, for your relationships, for your life, I want to encourage you to aim higher. You will be surprised at what you can do when you stop telling the tall tale and start writing your own story. Write it well, and make it worth telling. The world needs higher bars and better narratives. Tomorrow my students will take their first round of STAAR testing in Writing, a subject I teach twice a day. The test is scored by their responses to 40 multiple-choice revising and editing questions along with 2 essays—one narrative and one expository. Although the Writing test is one of three they must pass in the 7th grade (along with Reading and Math), it was important to me to communicate to my students that it doesn’t mean that much to me. Allow me to explain. I have known my students for 8 months. I spend more time each day with them than with anyone else. I teach some of them for 3 hours a day (the lucky ducks who have me for Reading, AVID, and Language Arts). They are more aware of my quirks than anyone else (including myself—apparently I have an “about-to-go-off” face). They have taught me more about love, respect, and how to change the world than any other event, person, or experience in my lifetime. They are incredibly intelligent, highly talented individuals who encourage me daily to be a better person. I don’t need a test to tell me how valuable they are to our future. If they pass the STAAR tomorrow, it may say a lot about their growth as students. It may provide some evidence of their success in middle school. It may slightly indicate some part of their intelligence. But it won’t measure their worth as humans. It won’t tell the whole story. There has been a lot of criticism in recent years about the way education waters down learning the common core, the way teaching has turned to content and skills that may not matter at all. We have imprisoned creativity and labeled imagination worthless. We have boxed children into standards that say next to nothing about their abilities. We have mislabeled intelligence as the ability to answer multiple-choice questions. Today, I reminded my students that no one—not the world, the government, test-makers, parents, friends, family, nor society—gets to tell their story if they don’t let them. I sometimes hesitate to post stories about my students because it communicates to you that I believe my students’ stories are mine to tell. Just because I teach them and always speak highly of them does not mean that I always share the story about them that they might share about themselves. I try to do them justice, but I sometimes fall short. Since becoming a teacher, I have heard a thousand ignorant comments about how people see inner-city children. I have been devastated by friends who assume certain stereotypes about my children because they have never heard a better story about them. I believe it is my responsibility to tell the world a different, better, truer story about my children. Don’t take this as me saying that I get to tell my kids’ stories for them—they are the only ones with the power to do that. All I have the right to do is tell my story, which often involves them as leading characters. But when I was their age, bullies had told me so many untrue stories about myself that I had started to believe their fairytales. If it weren’t for the people who told me a different story, I would never have become the man I am. I wouldn’t be the Ben Taylor who knows his story is important and worth telling to others. I owe the same to my kids. Because of this, a day before the Writing STAAR, I read the essay below to them to remind them that their worth cannot be measured by any test, standard, or person. Perhaps you can find some hope in it too, if you have found yourself answering to the wrong measures of a person’s true value. You were born into the wrong times. In this age, they box you up, label you, and sell you for the price they think you’re worth. They size you up by how well you can shrink your brain to multiple-choice responses. If you cannot fit within their definition of intelligent, they will call you otherwise. They will work to ensure that opportunities aren’t handed to you by the same measure they are handed to others, that more doors close for you than open. They ask you to to tell them how smart you are in 26 lines–never mind that your story already stretches beyond lines and pages and books. In the short time you have been on this earth, you have held the weight of love, felt the sting of heartache, known the joy of laughter, bitten into the sorrow of loss. You are not a statistic. You cannot be measured or weighed or labeled or boxed or held down. You are what is right in this wrong world. You will alter perceptions and destroy the shaky foundations of stereotypes. You were born into the wrong times, but you will make them right. Whatever happens tomorrow–whether you pass or “fail”–will ultimately not define you, because you cannot be named anything you don’t answer to. Who you become is your decision. It is your story to tell, so make it a story worth telling. Many of the pages are blank, but rest assured: you are more than multiple-choice answers, and you are more than 26 lines. 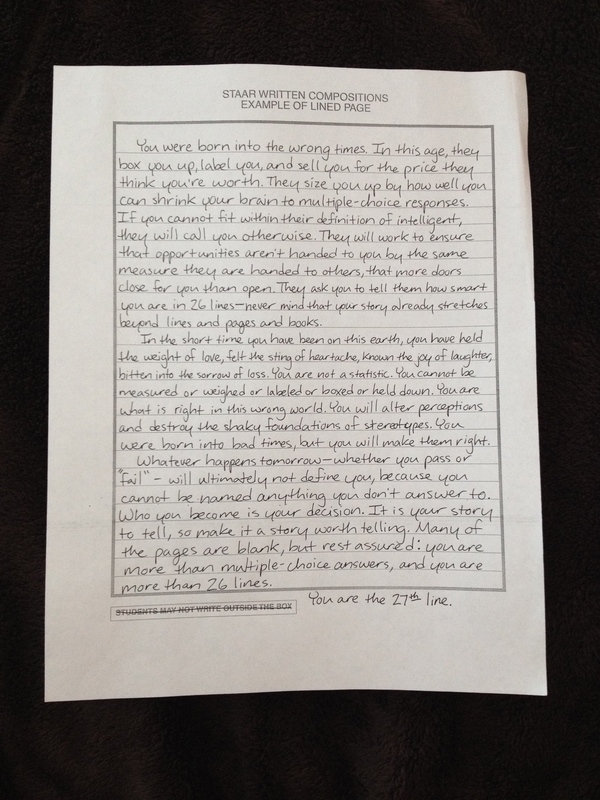 You are the 27th line. Scroll to the bottom to follow all of my teaching adventures!